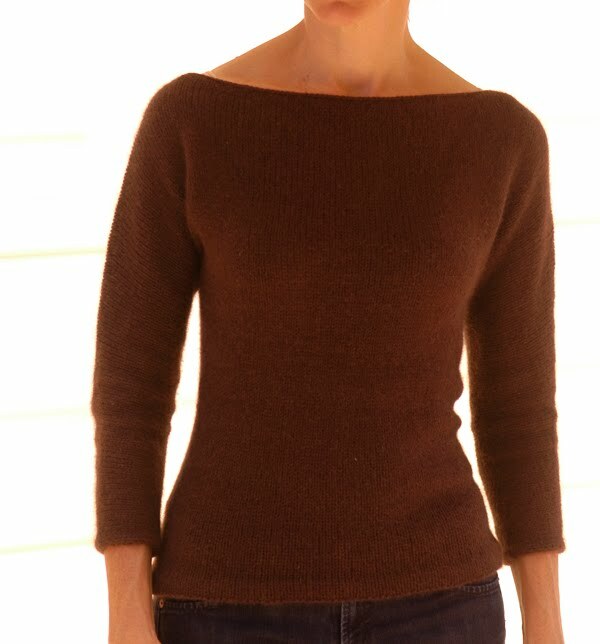 I'm currently working on a few fall designs for the lovely Lynn @ Knit 1 in Chicago and here's a glimpse of the first one. I wanted to create a simple classic shape and I love a boat neck neckline. 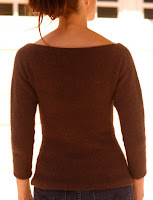 This piece is knit side to side (cuff to cuff) from the top down on #9's with Aslan Trends Invernal (color #22/295yds); a rabbit angora, merino & polyamide blend that is gorgeous! The pattern will consist of this sweater with 2 variations, the variations being a cuff & neck treatment in either crochet or knit for those looking for a little something extra. I'll post photos of the variations when completed. I love the way this sweater looks and feels. This will be hard to part with! On to a totally different subject but it does have to do with patterns. Last week my friend Terry sent me a link to a thread on Ravelry all about the fine print at the bottom of patterns stating what you can/cannot do with the pattern. It was quite fortuitous that she did as I was contacted by someone today who was questioning exactly what the crux of the Ravelry discussion was and that is the fine print that reads "for home knitting use only and are not to be knit for resale". When Terry brought this thread to my attention I started thinking about how I should change the fine print on my patterns to read, "OK to knit for resale". I'm flattered that someone who is trying to make a go of selling hand knits would think they could make some money using my designs and frankly if they did it without asking what could I do? If I found out someone in Russia was making & reselling my designs at a craft fair or out of their home would I really go to the trouble of legally trying to stop them? Now if they were mass producing them it might be a little annoying and if they were Michael Kors I would want a job! For me it's all about giving credit where credit is due. For anyone who has asked if they could sell items knit from my patterns I ask they give me credit as the designer and send photos because I like to see the finished piece; and for those of you who have purchased my patterns and are questioning if you can make it to sell please do just don't forget the courtesy of crediting me. And please email me if you do, I like to know where I can see your goods. first off, I LOVE that pullover! I'm a sucker for boat necks, and that looks so wearable and lovely. And second, I love your perspective on selling handknits. It's really down to earth and realistic. It's very hard to legally enforce things like that- just look at Etsy! I love boatnecks, too! Can't wait to see the rest of the window designs.